We can notify you when this product will be available. Please enter your email to receive notification. Includes 7 1/4" Quik-Change Blade-Left MAG-SAW Kit with Electric Brake - 424MAG, 18-Tooth Carbide-Tipped Riptide Blade - 12801, Carrying Case, Operating Manual. Porter cable has designed a flop. If you drop this saw (or the rh model) on the front corner of the table base, it will break off. It is mounted to a thin piece of plastic on the blade shroud. It lasted three days on my job site. Are we tough on tools? Yes. But the old P C saws could withstand all of our roughness and would only fail well after their anticipated usefullness. I have heard that they are addressing the problem. Maybe try Bosch for now. Pros: Well made, lots of power for *real* men, less than 10 lbs. Nice balance, blade left is great (for me). You get what you pay for, but twice the quality costs 4 times as much. Kinda like fancy bike parts. Excellent bearings, cuts straight with guide like (the better, but plunge-only) Festool. Cons: Very loose floppy blade guard, but does work great and does not stick. I am sick of McMansions, huge mega-pickup-trucks on jobsites, 10,000 sq ft houses on 12.000 sq ft lots, super-size-me. get outa my way attitudes. 15 amps is too many for many remodel circuits I do. Plug in this with another small tool- and bang you blow breakers. 10 lbs is too heavy for many uses I have, for a 7-1/4 inch saw. $140 is too much compared to a $40, 13 amp, 8 lb Skilsaw. Yeah, the PC is a pro saw and lasts until you break it... but the $40 Skil will still do the job if you select one with a good shoe. Now- before some macho nut job flames me- this is MY experience with this saw- and the Milwaukee, etc. I want balance, smooth operation, reasonable price, and reasonable quality. This gets 5 stars for quality, but 3 overall due to cost and excessive amp requirements. I find it difficult to believe that Porter-Cable would mount a critical part like the base to the gear housing with a plastic part. I'm looking at the parts list (go to their website to see it) and I see the base is mounted to the gear housing with a T that looks like it should be metal. There would be no reason to make it out of plastic since it would be cheap to make from metal and the problems this would cause would not be worth any economy realized, if any. "Early units were made with a Roll Pin Ref. 32 that was 1.5" long and current units are made with a Roll Pin that is 1.75" long. The longer Roll Pin Ref. 32 provides greater support for the Gear Housing Ref. 50 in the event the base is hit or the tool is dropped. A recess is required in the Upper Guard Ref. 51 to accommodate the longer Roll Pin. The current Gear Housing Assy. Ref. 50 includes the longer Roll Pin Ref. 32"
So maybe the shorter roll pin was a problem that is somewhat allieviated with the longer one in current models. Before purchasing this saw, I worked with a $50 Black & Decker Quantum. What a difference!! This saw cuts smoothly, has a nice blade and comparatively light. 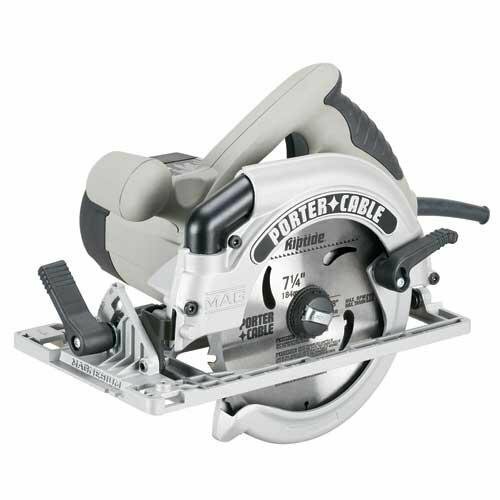 Other features like the electric brake, dust port, depth & tilt levers, and left blade make this saw outstanding. You can't go wrong with this one. It was as advertised...a little heavy, but it is 10 lbs. I love the blade offset on this saw. Other saws I have used have had uneven offsets which make setting a cutting guide on plywood a nightmare. This saw has ample power and the visibility on the blade left is great. I was particularly glad I purchased the blade brake as it adds a measure of added safety. I am very happy with the weight but I do exercise an added measure of care as I feel the magnesium frame might not fair well with a fall onto a concrete slab. This saw has exceeded my expectations. It's powerful, easy to use and lightweight. I used the adjustable exhaust outside two days ago. The exhaust was in the normal position (like other saws). As I was cutting some wood, the wind was blowing the chips into my face. I turned the exhaust vent toward the left, and the wind carried the chips away. It took two seconds to fix the problem. This is the best saw that I've ever used. Received saw today. Seems well made and the table looks very good. However, do not believe the note that it comes with a case. It does not! It comes with a very cheap bag that does nothing to protect the saw and does not even have a pocket for saw blades or the manual. The electric brake still allows the blade to spin for a good 3 seconds before it stops. Did not expect cheap bag and inadequate brake for this much money. I would return it, but I need it now so will keep it. This is a quality product, just as expected. The one drawback is that I have never gotten as comfortable with the left blade design as I thought I would.